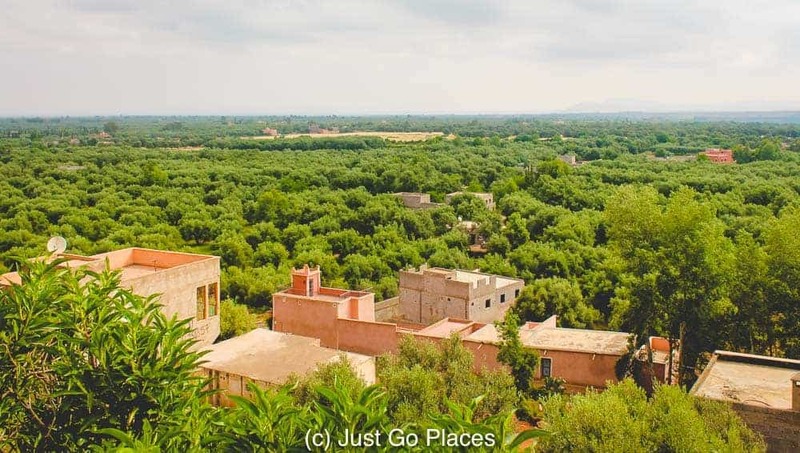 In Marrakech, you can see the Atlas Mountains hovering in the distance. 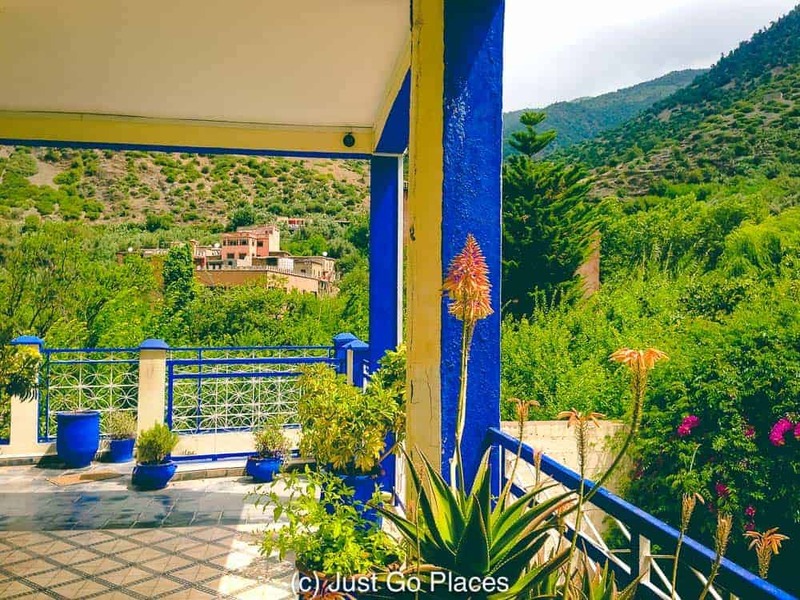 I have always heard how beautiful the Ourika Valley Atlas Mountains were and my interest was piqued. So we tore the kids away from the hotel pool and hired a guide to drive us for an Ourika Valley tour. 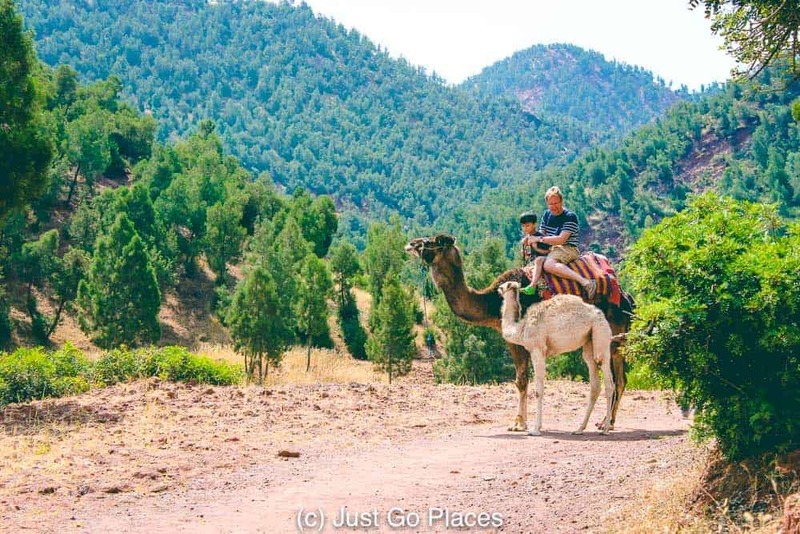 He took us to the closest villages in Ourika – Marrakech was just an easy drive away of about 50 kilometres (approximately 31 miles). 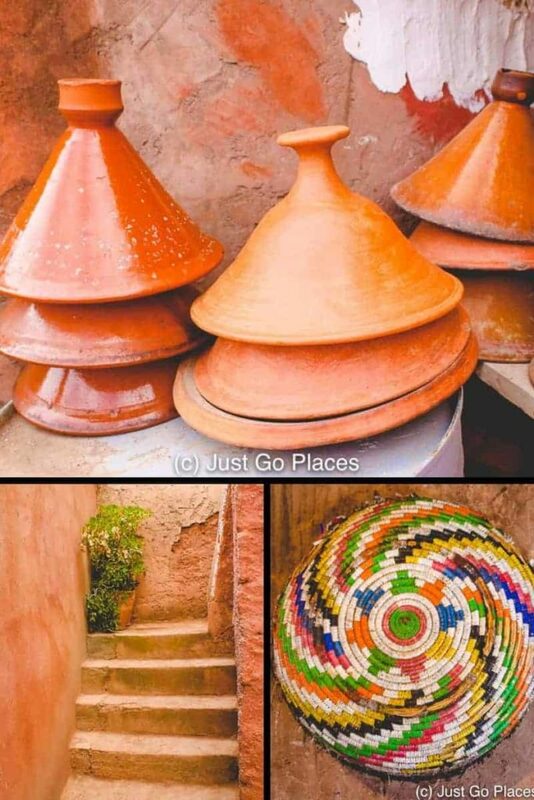 Although the Ourika Valley day trip was easy to arrange, we felt a world away from the cosmopolitan buzz of Marrakech. Moreover, even though the Ourika Marrakech route is so easy, we also felt that the area was a lot less touristy than the city of Marrakech. Life in these villages in Ourika Valley Morocco appeared pretty traditional and the outside world seemed far away. 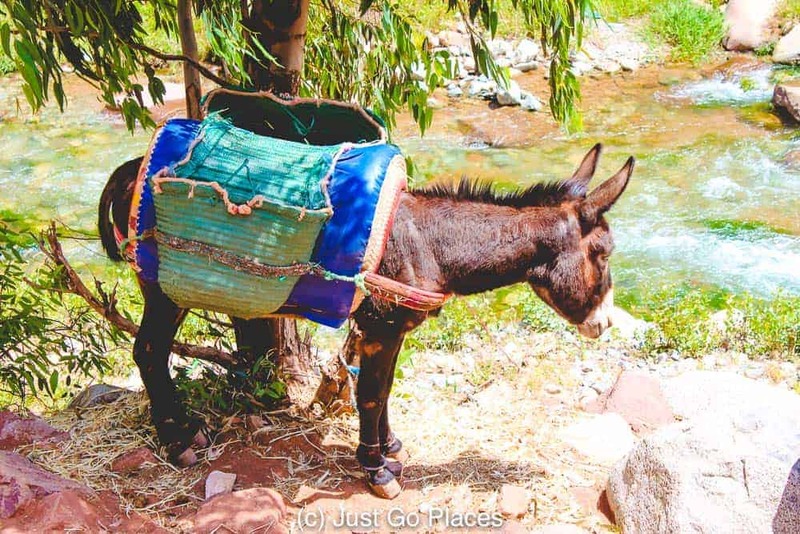 On our Ourika Valley tour we saw people carrying their wares on donkeys, little children just hanging around and houses clinging to the cliffs onto which they are built. With only a 4 day weekend in the country, we are glad we saw a bit more of Morocco than just the city of Marrakesh. 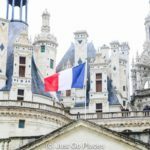 These little villages date from the 16th and 17th centuries. They are populated by Berbers who have lived in North Africa for thousands of years. 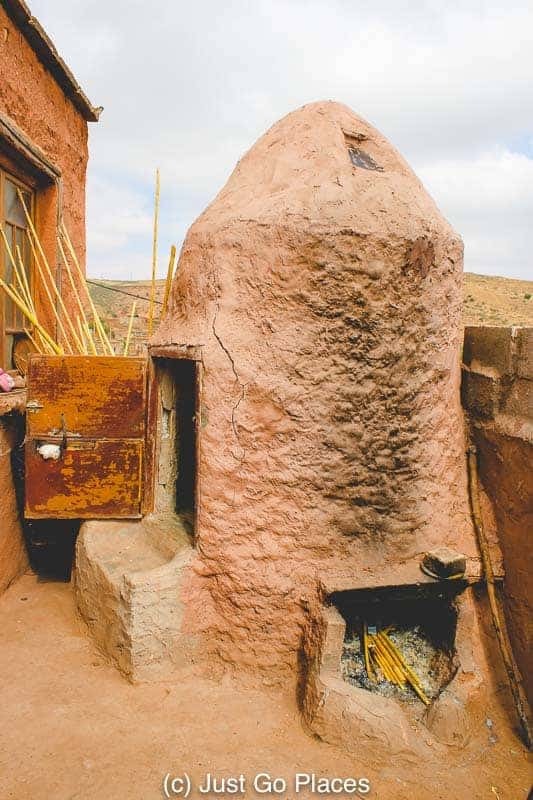 During the time of Arab rule in the Middle Ages, the Berbers congregated in the Atlas Mountains. 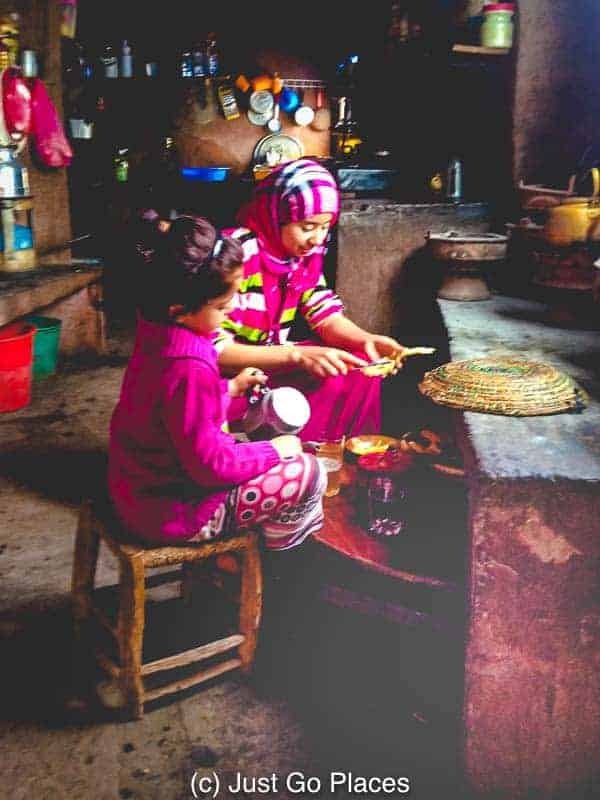 Most Berbers practice Islam now but they also have their own traditional culture, food and music. On the less quaint side, you did get the hard sell from trinket sellers and children begging for money. My kids did ask why so many children weren’t in school as well. Of course, we had to take the obligatory camel ride. This little camel refused to be separated from his mother. Ourika is great for hiking. Definitely avoid the summer months though because it will be uncomfortably hot. In the early Spring though you will see the spectacular sight of orchards and wildflowers blooming. 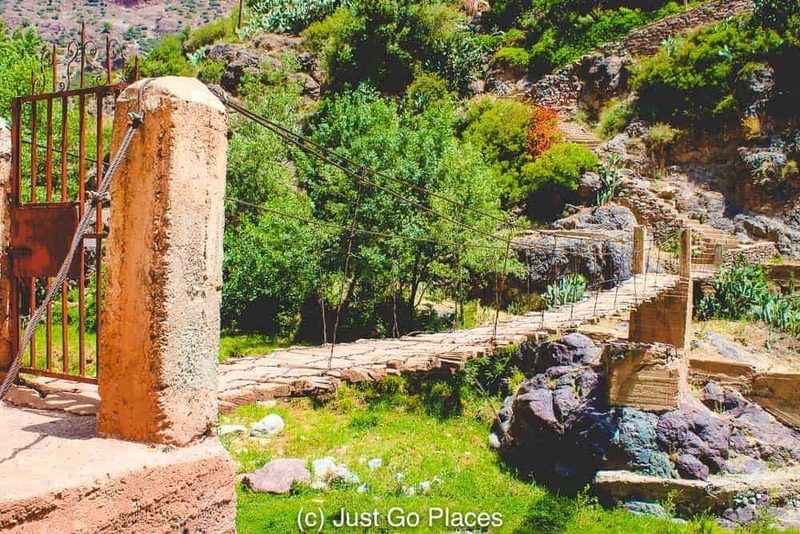 The Ourika Valley waterfalls are located near the Berber village of Setti Fatma but you will see smaller waterfalls elsewhere. We loved this Ourika Valley waterfall which our guide described as a Berber freezer. 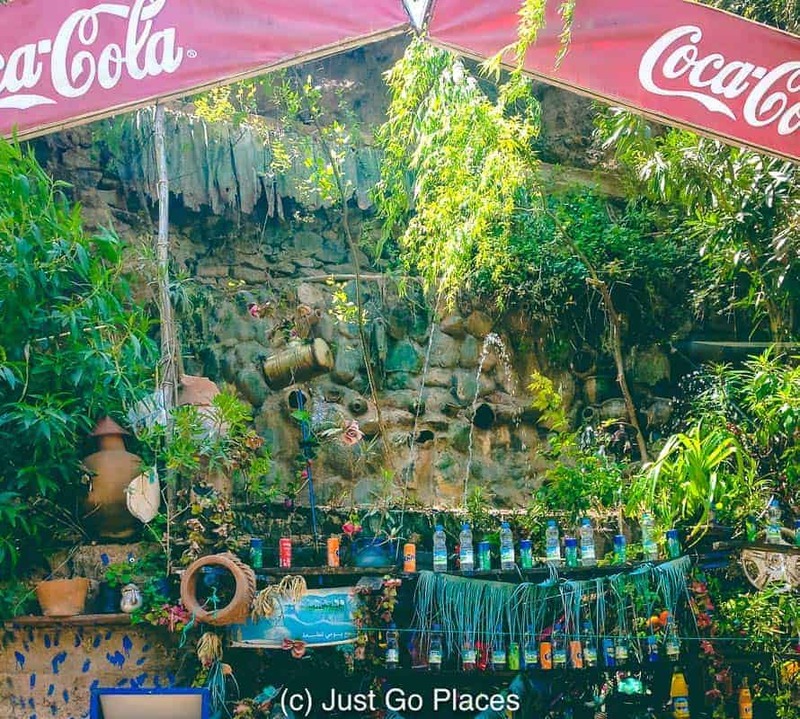 The cooling waters chill this Coca Cola stand set in an Ourika Valley waterfall. There are traditional markets and bazaars in the Ourika Valley but we did not visit on a day when they were being held. You know how much I love markets, bazaars and souks so this was a real disappointment. We did, however, get to visit one of the women-run Argan oil cooperatives that are located in the Ourika Valley. They don’t cultivate the Argan nut here but they do process it for making into oil. That cobalt blue on the building of an Argan oil cooperative made famous by Yves St Laurent’s Garden Majorelle. 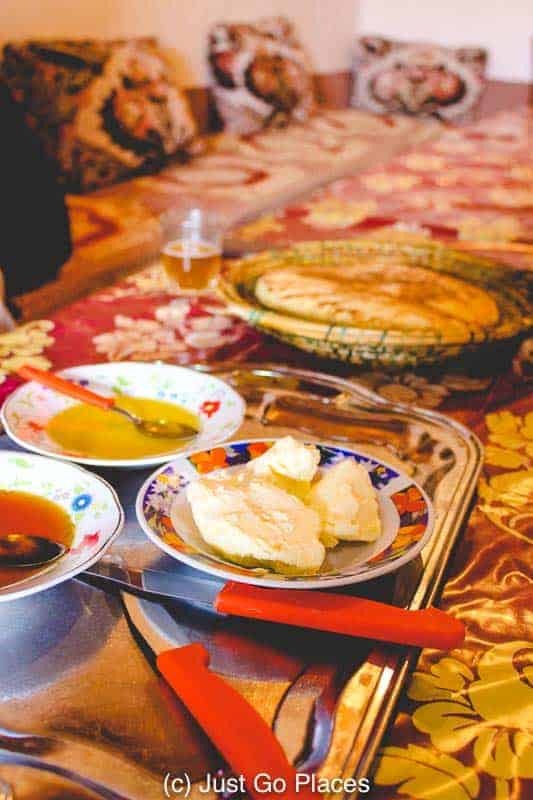 We were invited into a Berber home in the Ourika Valley for tea. I expect this home makes a pretty good living out of inviting tourists into their house because it was a seamless part of our Ourika Valley day trip. This house in the Ourika Valley is built into the hillside and there are lots of little internal stairs. it was built on 3/4 levels and also a terrace from which there were amazing views of the surrounding countryside of the Ourika Valley. I liked the colourful baskets which hung on the walls. Old tagines stacked in the corner give evidence of feasts past. This one-person hamam (steam bath) would be useful for those cold nights. You lit the fire outside and then took a bucket of water into the little hut and waited for the steam to build. Very efficient. Our snack was made in the home’s kitchen. It was bread with delicious butter and honey on the side for spreads. 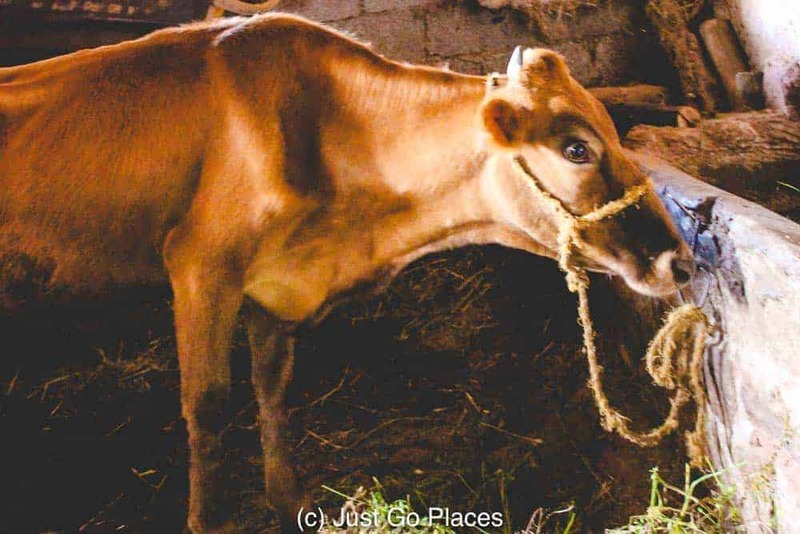 The butter was made in the home from milk made by the family’s cow who also had his little room right after the house entrance but before you entered the family living area. Piles of wood are stocked up for the wood-burning fires. The walls hold the bellows to keep the fires burning. Both the heating and the cooking used wood-burning stoves. We were fascinated by these rickety rope bridges which crossed over the river below – a very Indiana Jones sort of experience. Although this particular bridge had a gate (positively posh! ), many of the bridges were just boards haphazardly strung together. A gate keeps this rickety bridge from being used by interlopers. In this case, the bridge was two logs covered in mud. Handrails are for wimps! When we went the Ourika River was quite low but this river can flow quite high and fast. 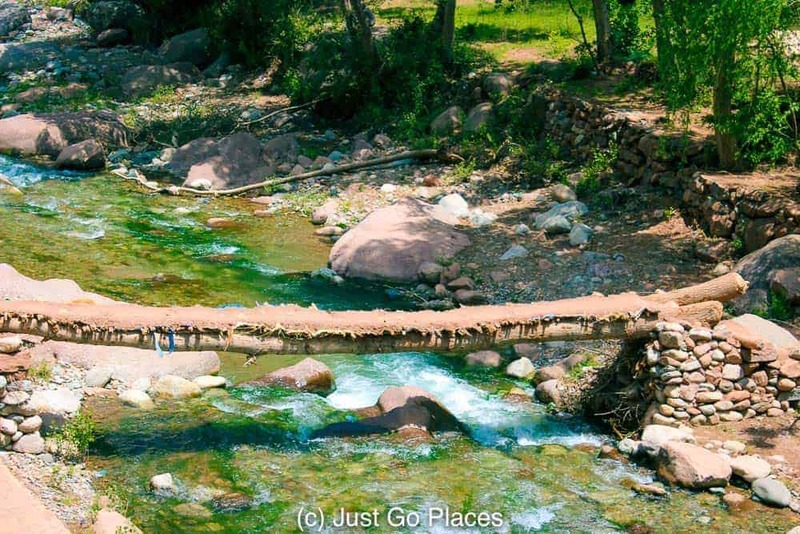 For example, there are river rafting trips on the Ourika River. Needless to say the children loved walked across the bridges. I was completely freaked out and made their father go with them! I could only stand by and pray that the boards were safe enough and ignore the rocks and rushing water right below their feet. The bridges seemed to lead to private homes as well as restaurants and other establishments. 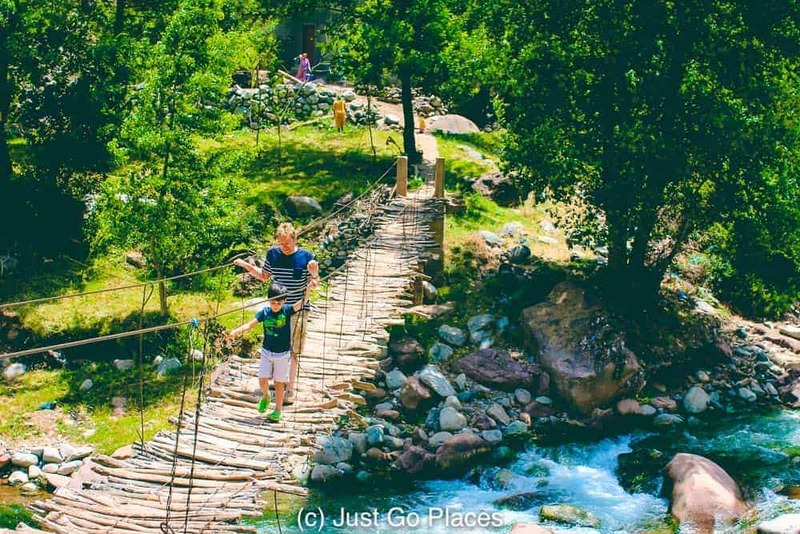 I thought the rickety rope bridges were a fascinating glimpse into rural Morocco – a world away from the health and safety concerns of Europe and the USA. I’m glad we got to see this different, quieter side of Morocco. 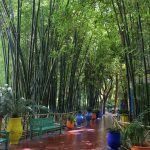 It felt a world away from the hustle and bustle of the streets and souks of Marrakech. Ironically, we came back from our long weekend and had to deal with a broken down car. Usually we take a taxi to/from Heathrow but because it was only a long weekend, we left our car in the airport parking lot – with a light on which drained the battery. Oops. I was even more glad though of our respite from urban life in the Ourika Valley. 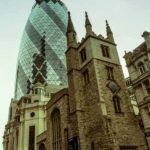 City breaks are a lot of fun but we find for a real mental break we need to get out into nature for a bit. makes the Ourika Valley special and have tea in a Berber home, and step back in time. Also those bridges! I wonder if I’d have been brave enough to walk them! Lol! I got super dizzy on one bridge. The kids were begging to cross a bridge and I tried to find the safest one (which is all relative).